BECAUSE I ALWAYS FEEL LIKE RUNNING is one of multiple productions by emerging artists that will be shown at the final day of SPIELART Festival. They can be visited one after another on Nov 11. For more information click here. 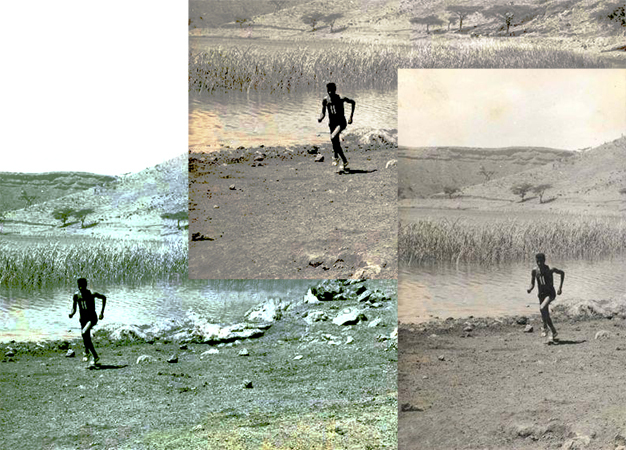 In East Africa the discovery of athletic heroism in endurance sports coincided with the independence movements. Therefore, since the 1960s with the Olympic Games in Rome, Tokyo, and Mexico City, success in sports is closely linked to the post-colonial formation of identity. Ogutu Muraya, who performed his piece NOBODY KNOWS MY NAME at SPIELART 2015, devotes himself in his performative lectures time and again to the attempt to transfer storytelling as a traditional art form in sub-Saharan Africa into a contemporary context. For BECAUSE I ALWAYS FEEL LIKE RUNNING he undergoes training for a long-distance runner and shows himself onstage running, and he lets his body become the narrator. Medical data collected live will be interconnected with documentary and historical material, and a narrative develops of will power and tenaciousness, and their correlation with global power structures in a context of international competitive sports. Ogutu Muraya is an author and a theatermaker, whose works explore the traditional, oral art of storytelling in very different ways. He views art as a catalyst for demanding one‘s rights and for preserving stories that frequently remain invisible within the mainstream. Ogutu studied international relations at the United States International University"Africa (USIU-Africa) and recently received his master‘s degree from the Amsterdam University of the Arts"DAS Theatre (formerly DasArts). In recent years his works have been shown at numerous festivals in Europe and East Africa. Supported by Bâtard Festival and Veem House for Performance.